When you&apos;re logged in, you can always find your dashboard at https://kumu.io/dashboard. Below these links, you&apos;ll see the main section of your dashboard, which lists all the projects that you own, as well as the projects you can contribute to. Your own projects will have your avatar next to them, and projects that you don&apos;t own will have the avatar of the project owner. If you&apos;re looking for a specific project or group of projects, use the dropdown menus above your project list to filter and sort. Or, if you don&apos;t have any projects yet, click the New Project button to get started! You&apos;ll notice that, above the project list and dropdown menus, there are two tabs: Projects and Organizations. Click the Organizations tab to see a list of which organizations you belong to, or create a new organization. When you belong to an organization in Kumu, you can view a separate dashboard that belongs to the organization. 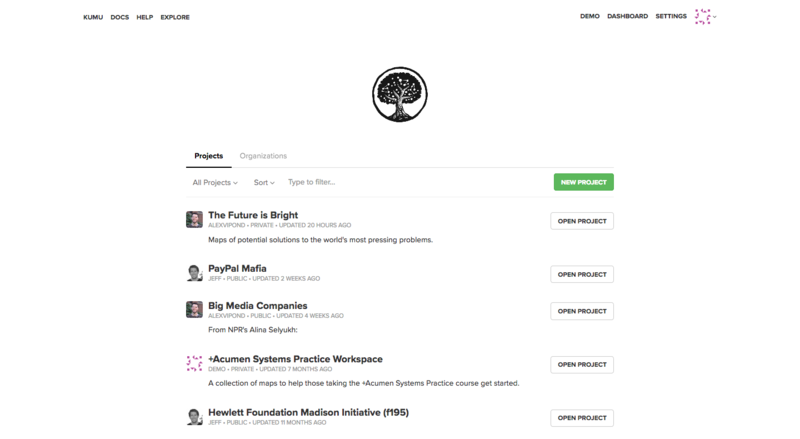 On this dashboard, you can see a list of projects owned by the organization, as well as a list of organization members and teams. For more information about adding members and creating teams, check out the full guide on organizations. Replace ORG-USERNAME with your organization&apos;s username to get a link to your dashboard. If you&apos;re an owner of the organization, you can scroll down on this dashboard to access your settings for branding, tracking, billing, and your organization&apos;s profile.